Like any voluntary organisations, running a Club is extremely hard and Tubber is no different, but it is made that little bit easier by the sheer goodwill of all the officers and officials involved who never cast a second thought when it comes to fundraising. 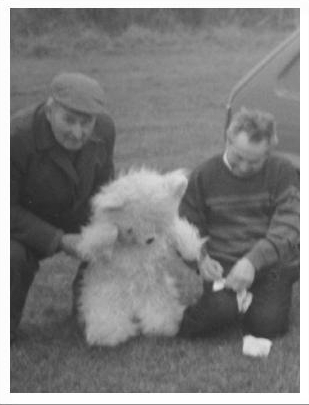 From the early days fundraising was essential in order to get the Club up and running and with the very first meeting of the Club on 20th March 1979, after a unanimous decision to form a Club, fundraising was the order of business. Under the chairmanship of Joe Grennan and the rest of the committee, Joe Higgins (Vice Chair), the late Bill Collins (Secretary), Christy King (Assistant Secretary), Mick Kinahan and James Guinan (Joint Treasurers), Ollie McManus, John Nestor, Marty Healy, John Rafferty and Tom Nestor, the first decision was made that each member would donate as much as they could to get the Club off the ground. From there the club branched out into a number of innovative ideas for fundraising. It was decided on 3rd March 1980 that the club would run a monthly 150 Draw.Tickets were sold at Â£1 a ticket with prizes ranging from Â£40 (1st), and three prizes of Â£10, with winning promoters receiving Â£5 (1st) and Â£2 for 2nd, 3rd and 4th prizewinners. The 14th December 1981 saw the Club appoint its first Finance Committee who took full control of all fundraising for a period. The first order of business in 1982 was the decision to run a Monster Draw, which went towards the purchasing of a pitch later that year.Tickets for the draw were sold at Â£1 each where a profit of Â£2,400 was made after the paying out of Â£520 in prizes along with administration costs. 3rd March 1982 saw a meeting being held to buy the field and after numerous negotiations with Richard Flynn, a playing field was purchased with help from door to door donations, where we collected Â£3,000 in a matter of days to boost club funds at the time. More and more money was needed to see us through and it was decided that we would commence a number of fundraisers, mainly in the form of the Calf Draw, which ran from 29th May 1982 for five years, a Hay Auction, annual Tea Parties and one of our most successful fundraisers "The Lord Mayor". 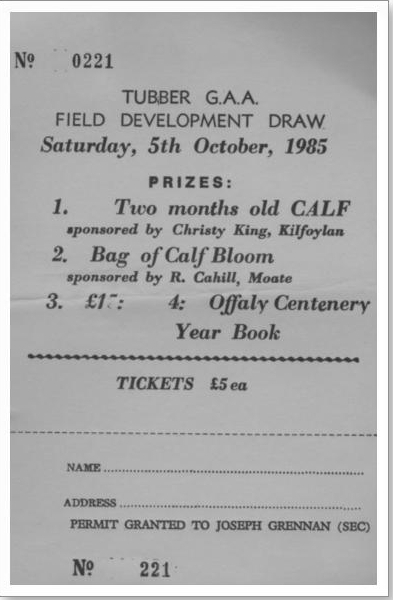 For the Calf Draw tickets were sold at Â£5 a ticket and over the course of the five years calves were donated by Donal O'Connell, Glenville, Co Cork; Mickey Molloy, Tully and Christy King, Kilfoylan. In June 1985 the club received a generous donation from Tommy McManus and Sean Egan who sent the club $1,150 from America. 18th November 1986 saw the club take on one of its biggest adventures in the form of "The Lord Mayor".Three candidates took part - Joe Grennan, Kevin Higgins and Tom Rafferty and it was their goal to raise as much money as possible. 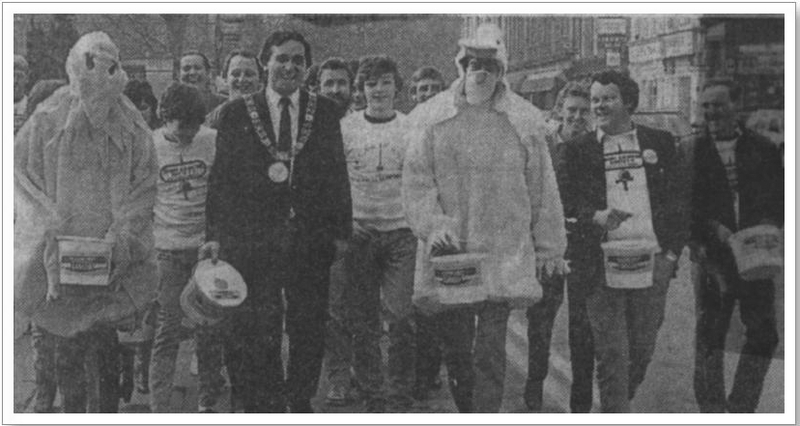 Over the course of four months in late 1986-early 1987 the three candidates coaxed and cajoled the community with various fundraisers such as a Duck Race on the Gageboro River, a Fashion Show, a sponsored walk from Dublin to Moate in association with the Irish Cancer Society and an Auction. Following the campaign a whopping Â£30,000 was collected for the club with each candidate raising over Â£10,000 each with nothing separating the candidates but Kevin Higgins crossed the line first by a short head to take the title. In 1988 the club along with several other clubs from around the country linked up with a club from Elphin, Roscommon for a Monster Draw. Tickets for that one were priced at Â£100 and in what was another successful fundraiser we made in excess of Â£6,600. Thanks to the goodwill of all the people in the surrounding areas who helped us through our fundraisers.We also had the joys of gaining various amounts of money through grants from the National Lottery and the Leinster Council. Since the Offaly County Board Draw commenced, the club has made a big effort to sell the tickets and as a result we have raised â¬74,300 over the last few years. 1991 saw the start of the Lotto Grants where we received Â£15,000 in respect of the dressing rooms, while Â£4,000 also came from Gerry Connolly from the Department of the Environment, along with Â£12,000 coming from Leinster Council to grant aid the original purchase of the pitch, the development of it and the building of the original dressing rooms. In October 1994 it was decided that we would start up a Club Lotto as local lottos were getting popular at the time. The jackpot started at Â£500 with a ticket costing Â£1.The first winner of the club jackpot was Mickey Mullins of Castledaly with the winning numbers of 3, 11, 17 and 24 for which he received Â£1,800 for his luck.The seller of the winning ticket was his own brother-in-law, Benny Moran.The club has had many good runs with the lotto and several local people have won the jackpot. The biggest winner so far has been Jim and Mary Murphy from the club who scooped over â¬18,000 in 2009. The club has made various efforts to improve and boost its takings over the years including master lotto tickets where you are included for a fixed number of draws and also the introduction of the online system where people from afar can purchase their tickets on the internet. The draw now takes place every second Monday night alternating between the Cat and Bagpipes, The Well and Paddy Ryans in Horseleap. This venture is a great source of income for the club and the effort of all the subscribers, collectors and the many people who down the years have attended and helped out at "The Lotto" where some socialising and craic was to be found and the banter heard on these nights is harmless. 2002 was the clubs next Lotto application where we received â¬44,441 in respect of our clubhouse. That same year we had two successful fundraisers in the form of "Sponsor the Block" where we collected â¬10,200 and an Auction/Barbeque where we collected â¬23,918. 2003 was our next venture, this time in the form of our ball stoppers and tarmacing of the ground. The National Lottery came up trumps once more with â¬18,989, while The Leinster Council also gave us â¬7,000 in respect of various projects. In 2005 the National Lotto aided us with our Lights where we were awarded â¬55,000 in aid. Also to aid our lights we had another Auction netting â¬16,218. Over the years the club also had the joys of some wonderful sponsors - Midland Electrical, AB Oils, S & F construction and the Cat and Bagpipes who are our main sponsors for the past number of years and for all their support we are forever grateful. In 2008 we set about building a gym that we have today and thanks to the National Lottery and Leinster Council once more we received another â¬98,000 in total which included aiding us in buying the equipment for the gym. 2008 also saw us take onanother huge fundraiser in the form of a night at the dogs in Mullingar. Once again thanks to our wonderful supporters we collected in excess of â¬24,000. None of where we came from to where we are today would have been possible if it hadn't been for those who had the vision to bring this Club forward and to those who have supported us through thick and thin and for that we are forever grateful. Down the years, the Club has never found itself in debt regardless of all the ventures we have partaken in, so NAMA need not worry about us! Indeed the Club is indebted to all the people who have supported them down the years and long may this support continue into the future. Gabhaimid buÃ­ochas le gach duine a thug cabhair dÃºinn.